My name is Bill Barr, retired from Ford Engine Engineering. Starting in the fall of 1962 I was the Dynamometer Development/Test Engineer for the 1963 Indianapolis pushrod engine and then one of the five engineers in the Indy Engine Group for the 1964 DOHC engine. The 1964 group included a supervisor, a principal engineer, five design engineers, and a Dynamometer Coordinator. The 1965 Indy Engine Group expanded by one engineer. After the 1965 race for which 50 "production" race engines were built and sold (and Jim Clark won the 1965 Indy 500 race), the Indy Race Group was disbanded and personnel were dispersed to other engine engineering projects. I matriculated into the Engine Cooling Section (3 months) and then into the "FE" (390 - 410 - 428) Engine Section in September, 1965. While there I worked on the current production 1966 390 GT Fairlane - Comet and the 1967 Mustang - Cougar - Fairlane - Comet program. The 1967 Mustang 390 GT was a disappointment to Mr. Tasca of Tasca Ford in Providence, RI. In late 1966 Mr. Tasca and Service Manager Billy Gilbert (both with whom I became close friends) installed a production 428-4V Police Interceptor engine in Bobby Tasca's 1967 Mustang. 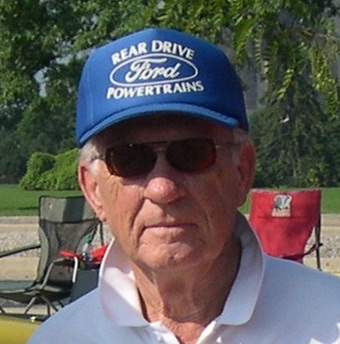 Billy Gilbert persisted in modifying and tuning the engine and the chassis to make Bobby's Mustang outperform Chevy and Mopar products in and around Providence. When Bobby's car was quite successful, Mr. Tasca named the final combo the "King of the Road 1968" (KR-8). Presumably, Mr. Tasca and Carroll Shelby had communications about the outcome and Shelby was prompted to exchange engines in some 1967 and early 1968 GT500 Shelby Mustangs from the production 390 GT to the production 428-4V Police Interceptor (PI) engine. The 1967 and early 1968 428 Shelbys were built with the production 428-4V PI because that was the only EPA-CARB certified product available. Nearly simultaneously, Mr. Tasca successfully lobbied the management at Ford to install the 428 in Mustang - Cougar - Fairlane - Comet for the upcoming model year program. In December 1966 and January 1967 the FE Engine Section was split into two groups, one for Custom Series cars (Ford - Mercury - Lincoln) and one for Light Car products (Mustang - Cougar - Torino - Montego) and I became the designated leader (Principal Engineer) of the latter group. Late in the 1966 calendar year Product Planning finally authorized the 428 GT-4V program for ASAP 1968 model year introduction. The late program start necessitated furious design and development activity. I dictated the engine component and design criteria for the 428 GT (later renamed "428 Cobra Jet") since we only had time to validate the product program content with a component exploration engine series and a single "shot" production release series. The program was engineered, designed, tested, validated, released, and certified between January 1967 and August 1968. * ALLOWED MAXIMUM POWER CONDITIONS FOR TEST: Maximum compression rated, maximum clearance, no air cleaner, exhaust headers, minimum exhaust back pressure, maximum carburetor air flow (no choke plate or throttle plates), high-hour engine with no alternator, manual control of fuel and spark: optimum (LBT) fuel and spark (MBT) advance, power level corrected to 60° F at sea level standard barometer. ** "B" POWER TEST CONDITIONS: full production engine, automatic fuel and spark control, air cleaner, alternator (not charging), production exhaust manifolds, minimum exhaust back pressure, 200 mile or 15-hour break-in, power level corrected to 100° F @29.5" HG. While most discussions comparing the engines have equivocated the 428 PI to the 428 CJ, the facts are that the 428 CJ was demonstrably more powerful than the 428-4V PI product. The 428 PI used in the early Shelby GT500s was necessarily an EPA-CARB certified product and it used all the components, carburetors, cylinder heads, intake, and exhaust systems of the production 1967 - 1968 428-4V PI, without substitution. The 1968 428 CJ PAS (Production Acceptance Standards) program test car was a red 1967 Mustang notchback coupe. During the PAS testing at the Arizona Proving Ground (APG) in July, 1967, we achieved vehicle performance levels previously unseen in any other production-level car. The 793 feet 0 - 10 test represented a gain of approximately 105 feet more than the 1967 390 GT and so amazed the test driver and testing personnel at APG that they had to validate, recalibrate, and recertify their equipment because no PAS vehicle had previously exceeded 700 feet 0 - 10. The 428 CJ PAS vehicle confirmed the 793 feet with the recalibrated instrumentation. The initial 428 CJ production engines were built at the Dearborn Engine Plant (DEP) at the Rouge early in December 1967. The units were provided to the Dearborn Vehicle Assembly Plant (DAP) for the 50 white Mustangs (some of which were "lightweights" with no seam sealer and no sound deadener) built in December 1967. The 428 CJ regular production engine installation at DAP commenced in February, 1968. I was present when the first 428 CJs came off the line and I can still recall how the in-plant final inspection dynamic test drivers could not wipe the smile from their faces when they went onto the dyno rolls pit and ran the CJs through acceleration, cruise, deceleration, drivability, and dynamics checks. This article has been edited by Scott A. Hollenbeck.